The song was written by Tommy Boyce, Bobby Hart, Jeff Barry, Angelo Badalamenti and Marianne Faithfull. However only Boyce and Hart received writer's credit. "Hold on Girl (Help is on its Way)"
The original mono and stereo mixes differ slightly in two spots. On the stereo mix, Micky's vocal is dubbed in at the end of the instrumental bridge just before the second verse; this vocal bridge does not appear on the mono mix. During the fade, Micky's repeated, "Not your steppin' stone" begins sooner on the stereo mix than on the mono mix. The mono single fades out earlier than the track from the mono album, despite that both versions are shown with a playing time of 2:25. ^ Graff, Gary; Durchholz, Daniel (eds) (1999). MusicHound Rock: The Essential Album Guide (2nd ed.). Farmington Hills, MI: Visible Ink Press. p. 774. ^ a b Lefcowitz, Eric (2011). Monkee Business: The Revolutionary Made-For-TV Band. Port Washington, NY: Retrofuture Products. pp. 74–75. 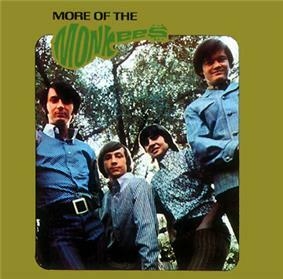 ^ "Monkee45s - Albums - The Monkees". Monkee45s.net. Retrieved 18 September 2012. ^ a b c "More of The Monkees - Charts and Awards". Retrieved 24 June 2014. ^ "Chart Stats - The Monkees - More of the Monkees". chartstats.com. Archived from the original on 29 July 2012. Retrieved 3 June 2011.